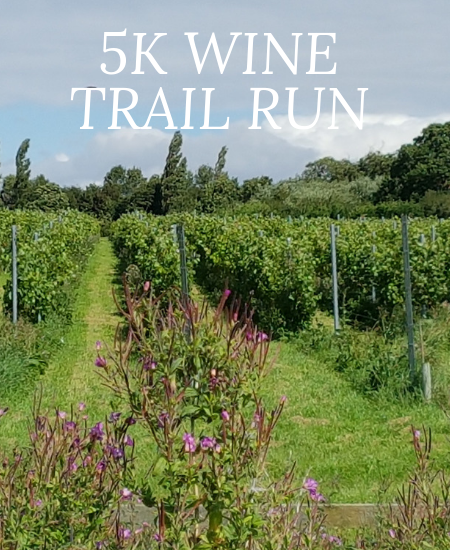 Choose to run or walk 5 kilometres through the vines, fields and around the lake in the depths of the Nottinghamshire Countryside at Hanwell Wine Estate. As well as water you’ll find wine at the water station, there will be 2 visits to the water station. There’s free wine tasting at the finish line too! There will be a selection of breakfast pastries, tea, coffee and cakes available for sale in the Hanwell Tasting Lodge. Spectators are welcome. Dogs on leads are welcome to spectate too. Wine tasting is available for all participants and spectators free of charge, come and try wines made from grapes grown in Nottinghamshire. We operate the “Challenge 25” policy so if you are lucky enough to look younger and want to try wines please bring appropriate ID. Prizes for first male and female may be wine related!! Places are limited so book today to secure your place on this unique running event.